SMC-Browser is a web application, that allows to explore the data-space of the CMD-Framework, i.e. 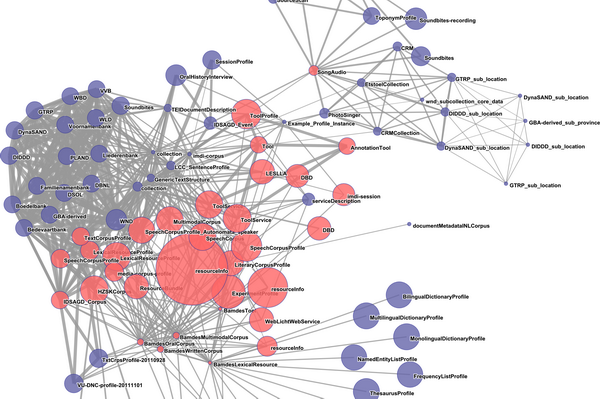 the growing number of Profiles, Components and Elements and their semantic grounding in the data categories of ISOcat. As such, it targets the data modellers of projects, concerned with the task of developing new or reusing existing metadata schemas. It enables them to gain a better overview of the existing CMD Components and their usage, thus helping to foster reuse and to prevent the component proliferation. This application builds on top of a number of the components of the CMD-infrastructure, making this a horizontal showcase. Extension of the Gretel tool to other corpora (in particular the big upcoming Dutch Written Corpus) with a user interface and implemented as web services (for modularity reasons). MIGMAP is a web application where the user first chooses generation (forward or backward in time) and gender, while the migration map of The Netherlands related to an interactively pointed municipality (or other aggregation unit) is shown. The existing map-making software module ""Kaart"" of the Meertens Institute has been transformed into a generic, standards-based tool for the creation and presentation of maps with complex spatio-temporal diffusion data in a user friendly and interactive way. It is based on the availability of places of birth and residence (in 2006) of the Dutch population (16 million alive, 6 million deceased but included) and their family relations from the Civil Registration, so that migrations patterns between municipalities (and immigration from abroad) can be presented over three generations in the 20th century. The Place Names Database (KNAB) is a systematic computerized collection of data on geographical names from both Estonia and abroad that is being developed at the Institute of Estonian Language. Its purpose is to facilitate the study and standardization of geographical names by providing data on their history and modern use. It has been planned as a linguistically-oriented database, to enable to compile and prepare different gazetteers and dictionaries. The data of KNAB may be freely used provided that the source is quoted. Extensive usage of the data (e.g. if a monograph, gazetteer or a map is based on the data of KNAB) will be possible on the presumption that the compiler of the database be informed of this usage beforehand. There will be no charge for the use of data, instead the user might receive information on the completeness and reliability of the data he/she needs. Historians, literary scientists, and others are interested in the semantic interpretation of text. With automatic pre-processing of texts, e.g. named entity recognition, coreference resolution, and dependency parsing, relevant semantic relations can be extracted. The Stuttgart tools extract relations of migration, i.e. name and job of the migrant and date, reason and destination of migration. 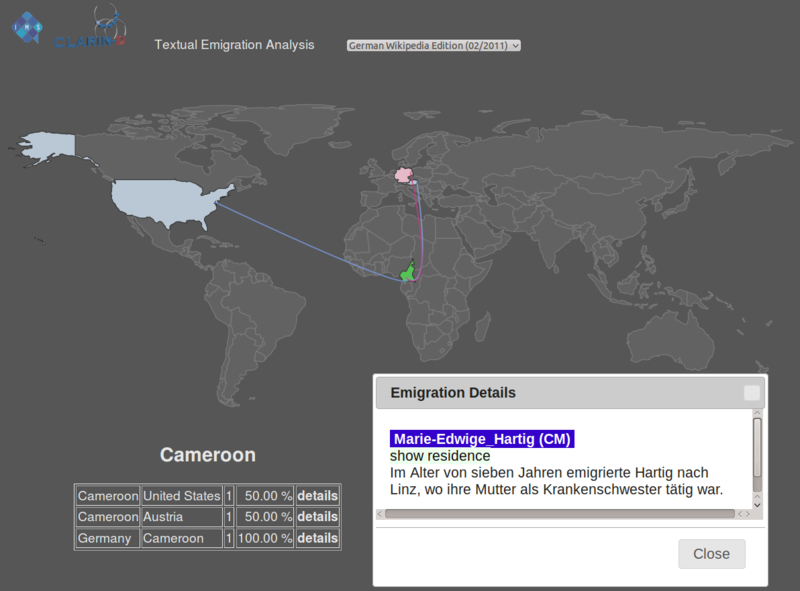 A graphical interface showing timeline and geographic migrations will be implemented.